We are a family-owned business that values good food and good service, and giving back to the community. 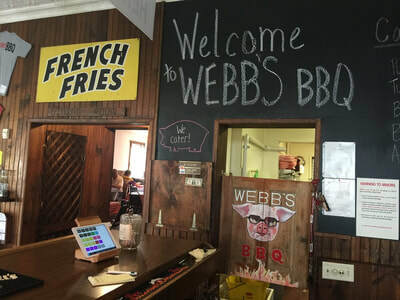 Webb's BBQ started off as a part-time catering gig, and then we moved to a more permanent location (115 East 9th Street, Newport, KY) to spread the BBQ love. Not only are we available for catering, we are now open as a restaurant every Friday from 11:30 am - 9 pm (or until we run out!). Webb's BBQ can also host your next event - receptions, birthday parties, board meetings, reunion, etc. If you are interested in have your next event at our place, contact us for specifics. Check out our menu and contact us to inquire about placing a catering order or having your group join us. We look forward to serving you. Open Fridays, 11:00 a.m. - 9 p.m., or until we sell out! If you are interested in catering, please contact us. Note that we cannot take phone orders on Fridays. If you have a large order and know in advance, please contact us earlier in the week and we'll have it ready for you to pick up on Friday!